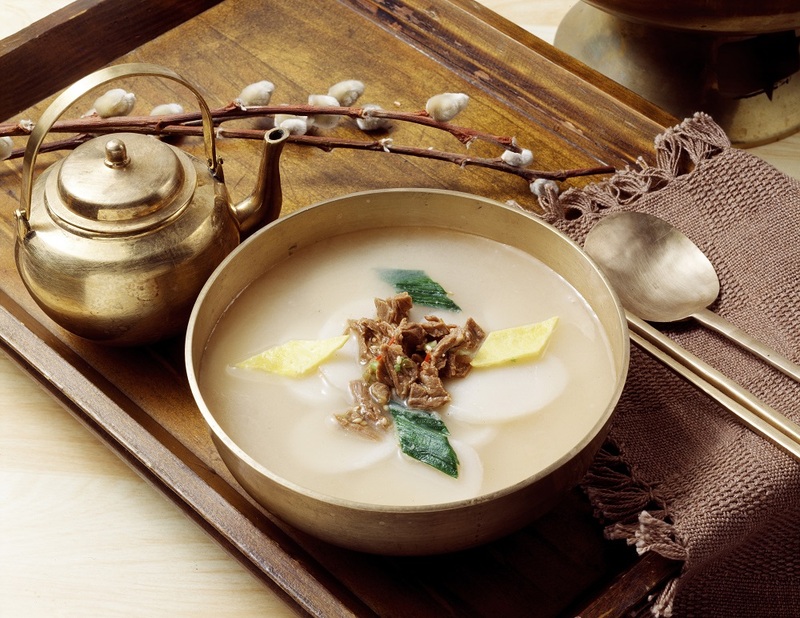 Tteokguk is a soup made with sliced rice cakes, usually in beef broth. It's a traditional must-eat New Year's dish in Korea. "Tteok" means rice cake, and "guk" indicates soup. The type of rice cake used for this soup is called garaetteok, whici is unsweetened and looks like a white water hose. But nowadays you can get already sliced garaetteok (rice cake) from any Korean grocery shop; even in Korea, making the soup preparation much easy. Often, Koreans add mandu (Korean dumplings) to tteokguk, in which case the soup is called tteok-manduguk. You can use any kind of mandu in the soup. This starchy and soothing bowl of soup is not only a New Year's tradition but is classic comfort food any time of the year! *12 -16 pieces mandu (Korean dumplings) – optional (you can make your own mandu or can get already made mandu from Korean groceries. Its taste is quite different from Chinese dumplings. There are two types of mandu: the one made with kimchi and the other with meat. In a large pot, bring the meat, onion, scallions (spring onion) and garlic to a boil in 10 cups of water. Reduce heat to medium low and simmer, covered, for at least an hour until the meat is tender enough for shredding. Remove the meat and cool. Strain the broth, and discard the vegetables. 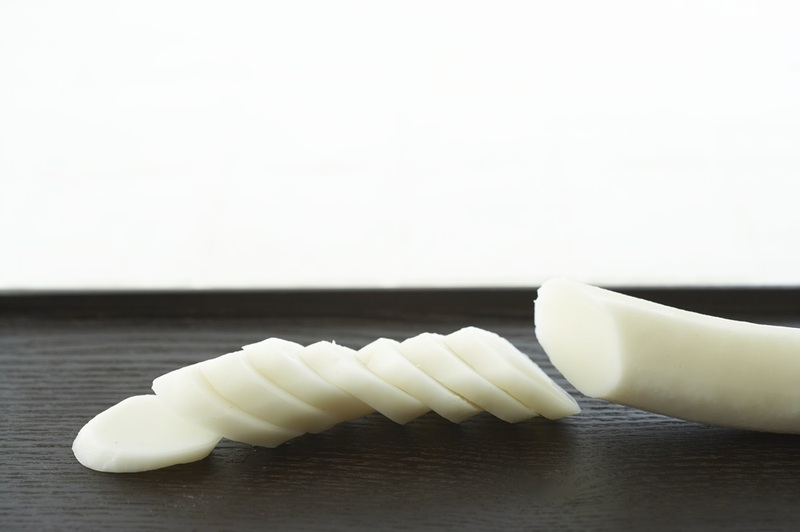 While the broth is simmering, soak rice cake (sliced rice noodle) slices in cold water for 20 -30 minutes and drain. Shred the cooled beef into thin 1 - 1 1/2-inch long strips and mix well with garlic, sesame oil, and salt and pepper to taste. Set aside. To make egg garnish, separate the egg and whisk each part well. Heat a lightly oiled small non stick fry pan over medium-high heat and pour each egg part into a thin layer, tilting the pan (similar to making crepe). Cook each side until no visible egg liquid remains. (Do not brown the egg.) Slice into 1 1/2-inch long thin strips. Set aside. Slice the spring onion diagonally into thin strips. Roast the seaweed sheet (nori) on a hot fry pan and cut into thin 1 1/2-inch strips. (You can buy already made one from Korean grocery shop). Set aside. Meanwhile, bring another pot of water to a boil to cook mandu separately. * Add mandu, stirring gently so they don't stick to the bottom of the pot. Boil until all of them float, and simmer for additional 2 or 3 minutes over medium low heat. Drain mandu out and add to the soup when the rice cake slices are cooked. Ladle the steaming soup into bowls and garnish with shredded beef, egg, scallion (spring onion) and dried seaweed sheet(gim) strips.